I just noticed that emissive materials behave completely different from 4.14 to 4.15 and I'm wondering if there's any way to get back the previous functionality or what I need to change to make emissive materials in 4.15 add more color to the scene. On the left is an emissive material in 4.14. Notice the amount of glow around the preview and how much color is added to the scene. The same basic material in 4.15 though looks completely different. Is it possible to get this same effect in 4.15? What changed? Unreal Engine changed their tonemapper with 4.15, therefore bloom looks different. Here is a forum discussion to bring it back and here someone suggested changing the DefaultEngine.ini and cranking up the values can get close to the old tonemapper. I didn't test this suggestion though, so I can't guarantee if it's the same result. Thanks Ninjin. That's exactly what I was looking for! To save anyone else time, open your projects folder and inside the Config folder you'll find DefaultEngine.ini. 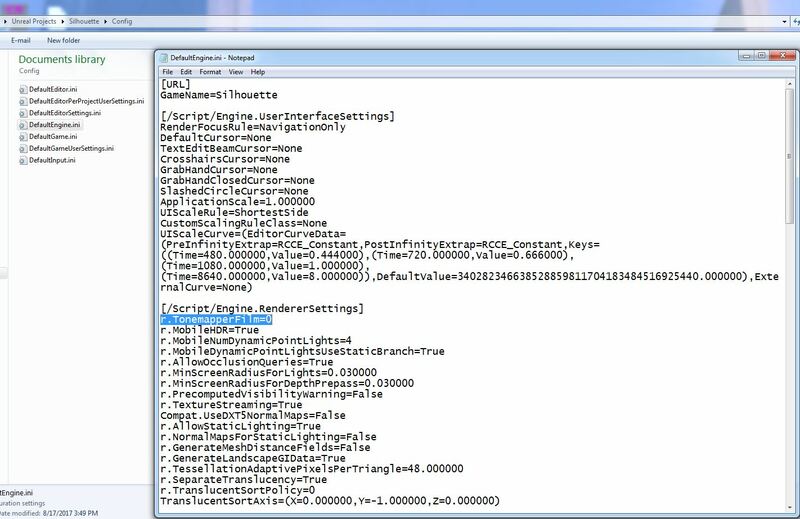 Open that and add "r.TonemapperFilm=0" without the quotes just below the [/Script/Engine.RendererSettings] header. The end result needs to be amplified about 10x more than previous but it gives what I think is an even better result than before as you still get the bloom and proper coloring but it looks more realistic. Sadly I think Epic made the tonemapper change permanent with 4.16+ so this change to the default engine only works for 4.15.